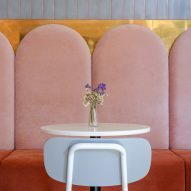 A colourful palette and custom furnishings outfit this cafe and bakery in Ukraine, completed by designers Lera Brumina and Artem Trigubchak. 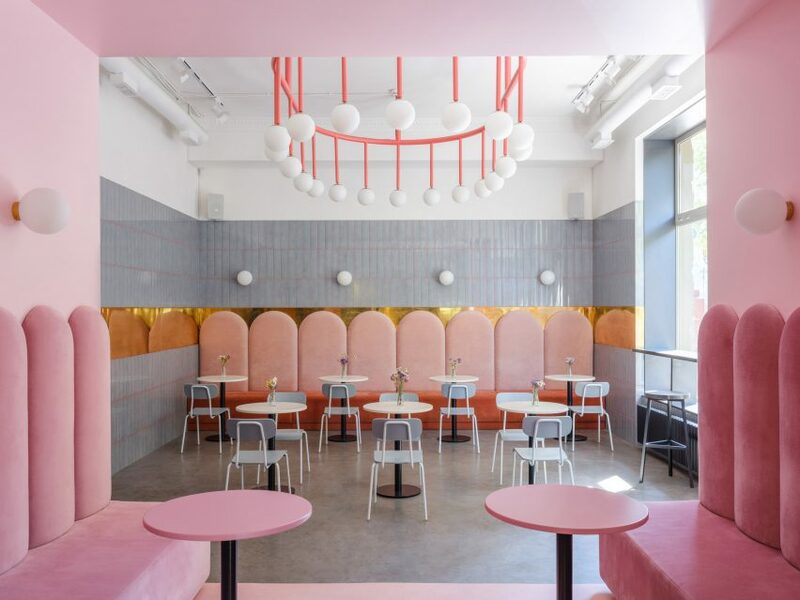 Breadway bakery is located in the historic port city of Odessa and features concrete floors, high ceilings and large windows, alongside a combination of soft pink and blue tones. Originally a dental clinic, the space is located on the ground floor of a stonework building and measures 914 square feet (85 square metres). 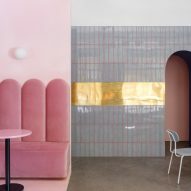 Two independent designers based in Ukraine's capital Kiev, Artem Trigubchak and Lera Brumina, overhauled the space into a vibrant eatery. 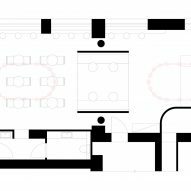 The layout comprises a counter and check-out area on one side, and a cafe on the other. A free-standing pink cube forms a corridor between the two, and houses extra seats and tables. "The space is divided into three parts according to their function," Trigubchak told Dezeen. "A deep-blue take-away zone; a waiting zone located in the centre of space, in a pink box designed especially for this task; and a light-grey zone where you can stay for a croissant with a cup of cappuccino." Large coral-coloured chandeliers affixed overhead on either side were custom-designed to emphasise the height of the ceilings. The designs feature 20 frosted globe lights, arranged in a circle. More splashes of colour add playful touches to the spacious eatery, alongside a variety of other furniture pieces designed specifically for the bakery. "Lera chose the colour palette, while structural work was divided between us," said Trigubchak. "The colour concept is based on the cold shades of pink-blue and grey, which emphasise the warm colour of bread." 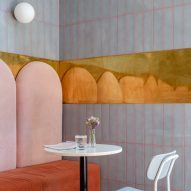 A pink-and-rust upholstered bench runs across one wall to provide seating in the cafe, with high scalloped backs intended to draw the eye upwards. The area is filled with small white cafe tables and pale blue chairs. Covering the walls are glossy grey-blue tiles by Ceramica Bardelli, fixed with pink grout. Paired with a thick golden strip, this shiny wall design amplifies the amount of natural light inside. 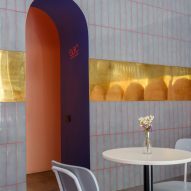 For to-go area, a peach-coloured counter sits in front of a bold blue wall, creating a highly contrasting visual. Behind is the kitchen and bakery. Two bathrooms are decorated with cobalt cabinets and pink sinks to match the rest of the interior. 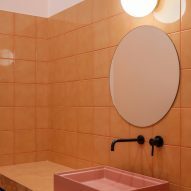 The rooms are further coloured by orange tiles on the walls and countertops, also surrounded by pink grout. 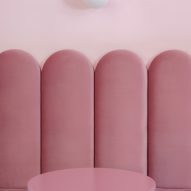 Pink is a popular colour for cafes around the world, as seen at recently completed projects in Tel Aviv, Montreal, Paris and Dongguan. Brumina also used the hue alongside pops of sage and blue during the renovation of an apartment in Minsk, Belarus.